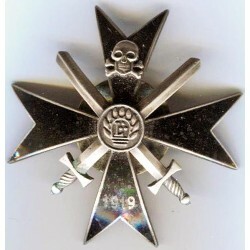 Latvian Orders , Medals and Badges There are 2 products. WWII Latvian volunteers cloth insignia - made from cotton in a good condition. Reproduction. 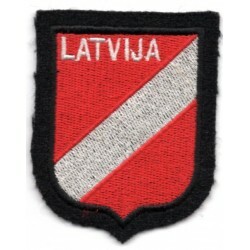 Dimensions - approx.57 mm x 82 mm Black wool construction flat topped, rounded, pointed tipped, bottom, shield shape base features a machine embroidered red shield with a pointed bottom tip with a central white diagonal bar and white script, "Latvija" to the top.